You would be forgiven for thinking “how hard can it be to find a tree?”. Often it is actually akin to finding gold. Especially when you’re looking for that solitary tree in just the right spot with just the right light that you can isolate in just the right composition. 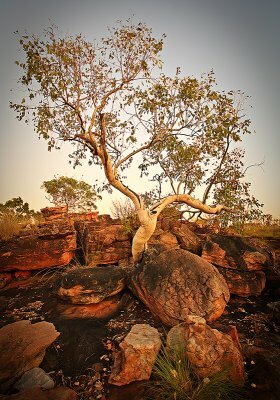 Much of nature and indeed the Australian outback is incredibly messy and extracting a beautiful composition out of chaos is the very essence of landscape photography. Finding a tree is a never ending quest! I love the mornings when bush camping. Waking up before dawn and rolling out of my swag. Getting my tripod and camera gear. Walking into the bush all alone in the crisp morning air. Experiencing the world with little to no sounds at all. Connecting to nature, to the rocks, the trees, the light, the smell. Looking for a spot to shoot dawn and sunrise. The experience doesn’t last very long as the sun is fast approaching but every second experienced at dawn is pure bliss. 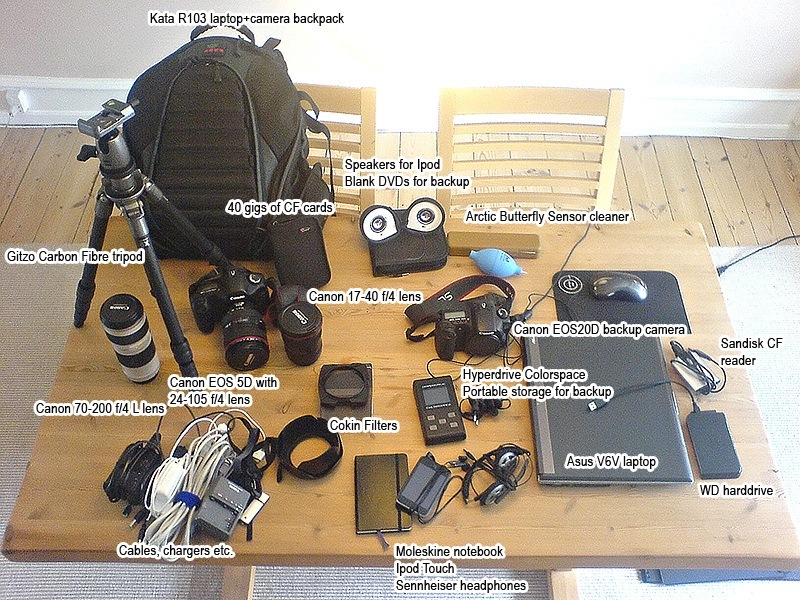 In August I wrote a post about my gear for a photo trip just before leaving for Australia on a 5 week photo trip. This is the story of what worked and what didn’t work in The Kimberley and Kakadu National Park in Australia. Click the Keep reading link below for the full detailed story of what worked and what didn’t! As a follow up to Where Sunrises Rule The World I will take you back to Hawk Dreaming and the edge of the crocodile and mosquito rich river. I will share my sunrise shooting experience with two new panoramas from this morning. I could have wished for a few more clouds (the appeared later as seen here) and a stronger composition. But the colours and the light are gorgeous and a true representation of sunrise at this river, and at large size you can see the lovely thick layer of mist on the floodplains. Let us examine in detail how to capture this light and these colours. Walk softly and always carry mosquito repellent! The composition in these panoramas is dictated by the mosquitoes. Ideally I would have been lower and closer to the water; making the river (a finger of the East Alligator River) seem bigger with more colour reflection in the water. No go mate. I have never experienced a wall of a million mosquitoes quite like this! There was no choice but to step back 7-8 meters from the edge of the river and still I was getting eaten. Without mossie repellent you won’t get these shots so arm yourself. This is Where Mosquitoes Rule The World! Be prepared; be quick! Coming from a cold dark non-tropical place you will be surprised by how quickly the sun rises in the tropics. You have very little time to work in before the sun basically jumps to the top of the sky and is at full force. So be prepared, arrive early and find your composition before the light show begins. The very best light is usually at dawn so no sleeping in! You should basically be setting up in complete darkness. Use ND graduated filters! I used a Cokin 2-stop ND grad filter to even out the exposure between sky and ground but learned that this is nowhere near enough to tame the tropical sun rising. I needed a 4-stop and even a 6-stop in my kit as the difference in light level especially at dawn is incredible. Still a 2-stop is better than nothing and without an ND grad filter you would either blow out the sky or capture a pitch black foreground. Do not blow the red channel! The red channel will be at least a couple of stops brighter than the other channels, so do not trust the luminance histogram on your camera. A blown red channel will ruin a tropical sunrise or sunset, creating ugly yellows and greens where there should be orange and red! Study your RGB histogram carefully if you have one, or bracket your exposures. Finally…enjoy! Do not get so caught up in shooting, checking histograms, looking through the viewfinder, levelling the tripod, setting exposure, focus and aperture etc. that you completely forget to enjoy the spectacle! Step back once in a while and take it all in. We shoot landscapes because we love nature so don’t let the camera get in the way all the time. Enjoy! I wish to take you on a journey into one of the Hawk Dreaming rock art shelters and try and make you feel what it is like to travel back in time. It is a difficult task describing this in words (time travel is a bit hard too), but do come along on this illustrated trip as we explore a Hawk Dreaming aboriginal rock art shelter. This is a stitched panorama shot from the river looking southeast towards the ranges. It was a hazy sunset but with good clouds and light above the rocks. I am trying to shield the camera as it was so windy on this night that I had to hook my backpack to the tripod to prevent it from blowing over! I managed to get some sharp exposures and I am very happy with this shot, it is quite successful I reckon at expressing the open expanse of the Hawk Dreaming floodplains and the ranges. As you sit here in the rock shelter and lookout over the glorious landscape then think back tens of thousands of years and have a look around. There are grind holes on the floor from grinding paint and flour. There is still charcoal on the floor leftover from fires. There is absolutely nothing to break the illusion. You are back in time. No fences, no signs, no roads, no people! This is not a museum. This is real; this is authentic and you are right there in it, experiencing traditional living with the land lifestyle. Imagine a clan of Bunitj people sitting right next to you, laughing, eating, painting, sleeping. Living in this very shelter. It is a great place to live, the land here provides plenty of food and the natural shelters make for perfect homes. It is a slice of magical time travel. Tens of thousands of years of living here is documented on the walls in layers and layers of painting. Again; this is no museum. This is time travel; this is real. The paintings range from just having fun recreational paintings to very important sacred paintings. A lot of it is food sources and dreamtime stories and ceremonies. Very interesting are the paintings of encounters with white people and before that, meetings with the Macassan traders in the year 14-1700. I apologise for the large watermark but have to protect this image as it is sacred art and is something I shot for the present custodians of Hawk Dreaming. I’m afraid I can’t show you close-up of the art; you’ll have to visit and see yourself! If you have visited other rock art sites in Australia I think you have spotted why this Hawk Dreaming experience is unlike any other. This is so real it becomes a time travel. Again; no fences, no crowds, no lines, no boardwalks, no signs, nothing that turns the experience into a museum like viewed from a distance feeling. Hawk Dreaming enables you to sit down in a shelter and take it all in with no filters between you and the authentic experience. I trust you enjoyed this trip in Hawk Dreaming sitting in a Bunitj clan rock shelter. It defines the word special and I can only attempt to capture a bit of this in my photos. It feels like ‘my country’ like home to me. Colour profiles is one area where I always felt Adobe Lightroom and Camera Raw could be improved a lot. 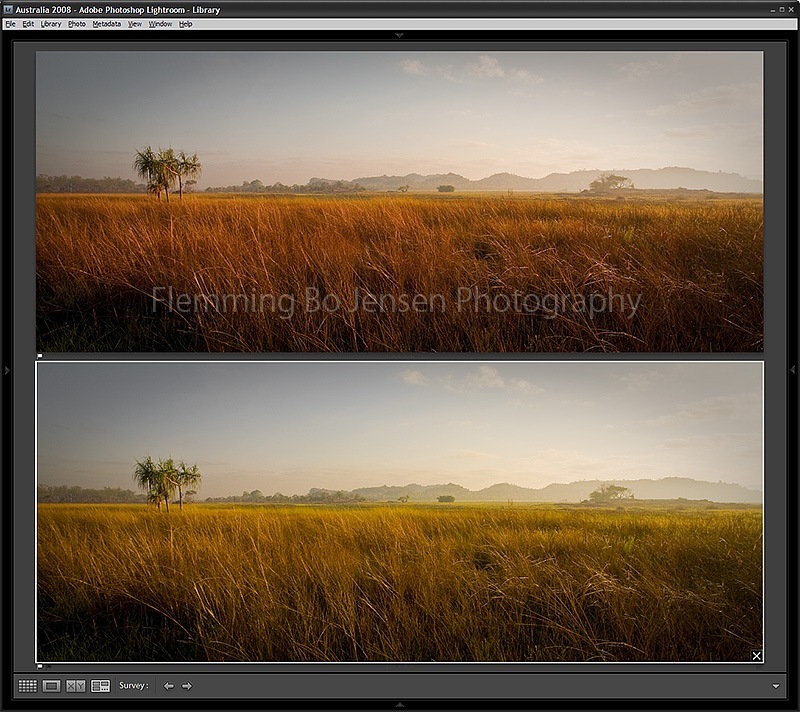 Rawshooter Premium had the brilliant ColorEngine plug-in with colour profiles from colour wizard Magne Nilsen. I was never able to quite repeat these colours in Lightroom or ACR. Until now. Fortunately Adobe Labs have come to the rescue with their much improved color rendering package. Have a look at this comparison of my Hawk Dreaming landscape, the top photo is the new Adobe Standard beta profile, the bottom photo is the standard Lightroom ACR4.4 profile. The rendering of red and orange hues is much improved in the new profiles so if you’re a Lightroom 2.0 or Camera Raw (you need to get at least version 4.5) user waste no time, download the profiles and follow the instructions from the Adobe Labs page and enjoy much improved colours! I recommend using the "’Adobe Standard beta’ profile in the package but try them all and see what you like best. What’s it all about? This is what it’s all about! Some moments feels like they should last forever, frozen in time. But they are over too fast and all that remains is the memory…and the photo. I can’t bottle these moments but at least I can shoot them. My eyes are always naturally attracted to against-the-light scenes; it must be my love of the sun. I love the light, the colours and the tall golden spinifex grass in this panorama. It is a personal favourite however because of the memory. The memory of standing here on this gorgeous morning; warm soft rising sun in my face, gentle warm wind against my body, the sound of birds and insects in my ears and my finger tips on my outstretched hands touching the moving waves of grass. Freeze time. Hope the future never comes. The future came but at least I still have the memory and the photo. And I feel quite grateful for being able to connect so deeply with the amazing nature in the amazing Hawk Dreaming. Connect, experience and capture nature’s magic. For me; this is what landscape photography is all about. This is a fairly simple against the light shot. The trick is getting the angle right. You can’t have the sun in the frame because it will overpower everything. But you want the front-lit effect, so you position the sun just out of frame and move sideways till you have the right composition and light and no internal lens reflections. One step can make all the difference! Get this right and exposure is easy and you will love the results. People who used to work with me when I did IT full time will testify I am not a morning person. I don’t function well in an office before I’ve had countless coffees and an hour of sulking. The solution? Change your job to shooting sunrises! Standing at the East Alligator River (with no alligators; just crocs) at 6am watching this light show is simply mindblowing. Imagine it is 6am, 25 degrees and Mother Nature rules the world. Every single sound (apart from my camera) is orchestrated by nature; every single light ray is controlled by nature. No people, no buildings, no power lines, nothing to distract. Just 100% pure humbling power of nature taking you back to When Dinosaurs Ruled The World. Sometimes scenes are so beautiful you just want to forget about the camera, sit down wishing you could live here and hoping the future never comes. This is a simple stitch; it is only two very wide horizontal images shot at 17mm stitched. It is a technique I use sometimes as I feel it better preserves the extreme 17mm wide angle look compared to shooting say 8 vertical shots but the stitch still gives me a wider view than 17mm. Nature did all the work as I did very little post processing of this. I set the white balance and added a vignette and a bit of shadow detail recovery and we’re done. I recommend getting up for every single sunrise, especially in tropical Australia. 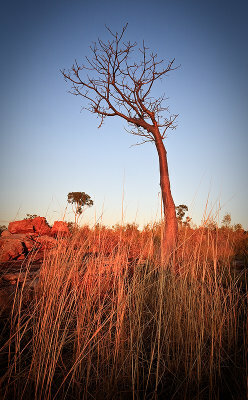 Often in the tropical bush the heat and haze of the day mixed with smoke from bushfires can result in a muted sunset. Sunrise on the other hand gets the fresh clean morning air to work with. Here; the sunrises rule the world.